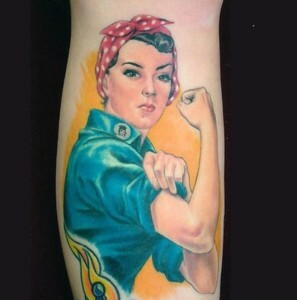 We want to see your pro-labor, pro-worker and pro-union tattoos! Share your labor-friendly tattoos on Twitter and Instagram with the hashtag #InkMasterUnion to show solidarity with the men and women who make the hit TV show “Ink Master.” If you don’t have a tattoo, you still can show solidarity by tweeting or Instagramming a message of support with #InkMasterUnion. Workers at “Ink Master” voted overwhelmingly for a union in 2014. Since then, Original Media, the master behind “Ink Master,” has refused to bargain in good faith with the Writers Guild of America, East, AFL-CIO. Original Media is being investigated currently by the National Labor Relations Board for failing to bargain in good faith and by wage and hour authorities for stealing hundreds of thousands of dollars from their freelance workforce.